Maitreya the Future Buddha is thought to arrive on earth when Gautama the Present Buddha has been forgotten and the Dharma has been ignored. This will be a low-point for Buddhism and the Maitreya will appear and turn things around. As part of Tibetan New Year celebrations the Maitreya statue is paraded around the exterior wall or perimeter of the monastery. It can be transported in a two wheeled cart pulled by local believers who volunteer for this special task, or transported on the shoulders of monks or significant others. 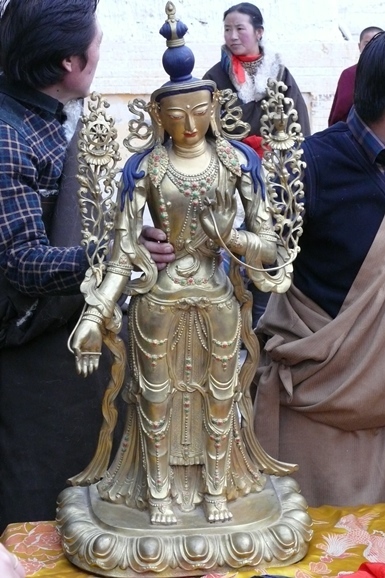 The sense behind parading the statue of Maitreya around the periphery of the monastery is to remind the faithful to ‘keep the faith’ and ensure that Maitreya returns only in statue form once a year to underscore the importance of the Dharma and the word of Buddha. Sometimes the Living Buddha of the monastery will accompany the Maitreya on the journey around the periphery. This is particularly nice for the local followers since they not only get to see the Maitreya but also to catch a glimpse of their Living Buddha. Usually the Maitreya statue is paraded around the monastery and then returned to its normal place in the appropriate temple. 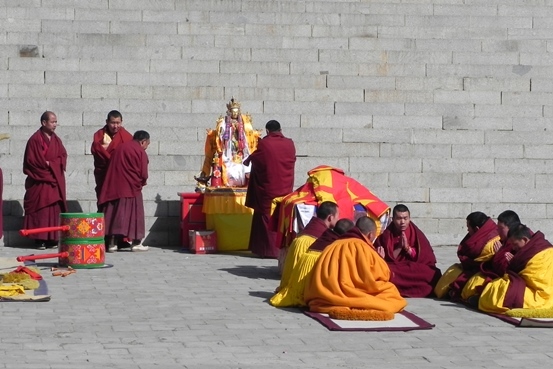 Recently, Gonlung monastery was scheduled to Display the Tangka in the courtyard immediately following the Maitreya Transportation. However due to an overnight snowfall and cold weather, there was too much ice and water on the roof of the Chanting Hall to permit the tangka to be safely deployed. So the Maitreya was displayed in the main courtyard in place of the tangka for one hour. The Maitreya statue is well revered and a superb piece of casting in its own right. Its simplicity evokes calm and concentration.